Korean YouTubers are making their way into the global market in partnership with DIA TV, a multichannel network for online content creators affiliated with local entertainment mogul CJ ENM. According to DIA TV’s announcement Wednesday, its partner creators are carving out successful careers overseas, promoting Korea’s entertainment culture. The firm partners with creator Banzz, a major “meokbang,” or eating broadcasts, creator here with 3.14 million subscribers on YouTube. In January, he collaborated with Chinese internet celebrity Mizijun. The two online buzz-makers visited a retail store operated by Chinese e-commerce giant Alibaba. The video has garnered 19.5 million hits on Weibo, China’s largest social media platform. 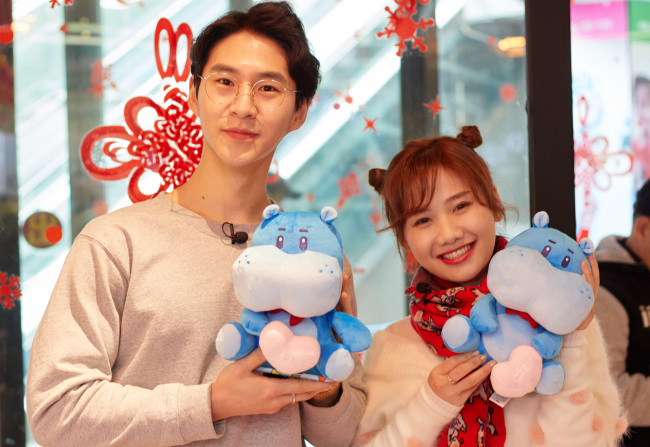 Earlier this year, beauty creator Calary Girl, with 1.19 million YouTube subscribers, was featured on online Japanese show “Kancos Holic” to introduce Korean cosmetics products in an e-commerce format. The show garnered 40,000 viewers in an hour and led to some 1 million yen ($9,000) in sales. DIA TV also partners with global partner creators, referring to Korean creators based overseas or foreign creators based in Korea. There are now 307 global creator teams partnered with the firm, including Claudipia with a South American viewership base and Sunny Dahye, a Korean YouTube star in Indonesia. The company has also been conducting a K-pop campaign, facilitating collaborations between K-pop stars and global partner creators. Nineteen K-pop acts, including In2It and Monsta X, have participated in the campaign, generating 7.25 million hits on YouTube. “Korean-language education, K-pop-related contents, meokbang and Korean makeup tips are popular categories (related to Korea) in the US and Europe,” said Lee Jin-hee, head of DIA TV’s MCN global team. “We are working on globalizing our content creators, strategically approaching platform distribution channels, contents and communication skills, depending on the country, its language and its culture,” Lee said. According to DIA TV, around half of its partner creators’ YouTube hits are generated outside of Korea. It partners with 1,400 content-creating teams, generating around 2 billion hits a month.